It looks as though I had better get this up before it is out of date. Our favorite V-Rod drag racer, Joe Lieske, made the trip all the way down to Baton Rouge, Louisiana for the AMRA season opener at the beginning of April. After a disappointing 2011 season plagued by catastrophic (read: expensive) engine failures, Joe and his wife/crew chief Cindy opted to back off on the engine size in search of reliability. The powerful but troublesome 95 cubic inch engine of previous years has been replaced with a still potent 88 incher. So far, so good (knock on wood). 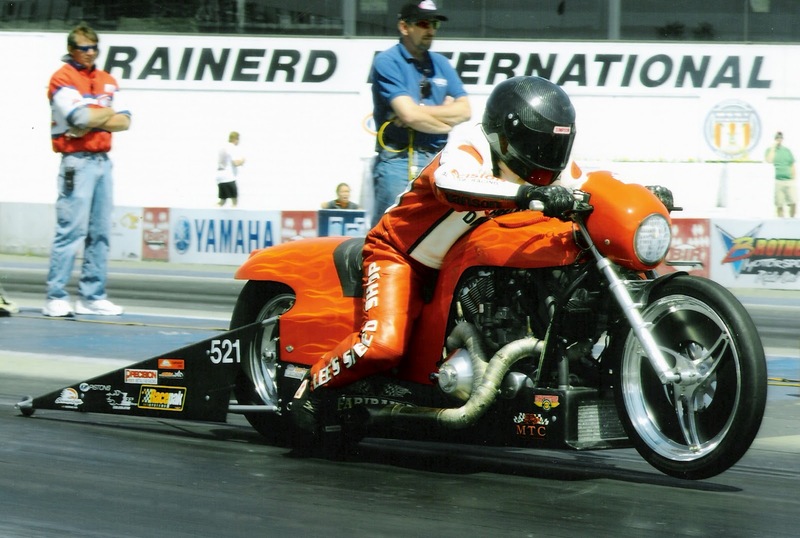 Some time between last season and this one, the AMRA decided that V-Rods would no longer be able to run in the Pro Gas class, but would instead be relegated to the V-Mod class. This actually worked out to Joe's advantage, since, after spending the qualifying rounds tuning the clutch, the bike came out cooking in the first round of eliminations. Cooking? Yup, I'd say it was cooking, since he served up a 5.530 second 1/8 mile @ 121.53 mph, along with an 8.832 1/4 mile @ 146.43 mph, all four of which are new National Records! Unfortunately Joe leaned a little too hard on the lights in the finals, turning on the red by only .012 of a second, costing him the win. The good news is that Joe reports that he is confident that a little more work with the clutch will bring his 60 foot times back down near his previous 1.15 second mark from the 1.20's he recorded in Louisiana. Joe's next race is this weekend (April 28-29) at Beechbend Raceway Park, Bowling Green, Kentucky. Guess I'll just go home. There is something about America's favorite new Pagan religion and its high holy day (Earth Day) that just rubs me the wrong way. Guess it has to do with the fact that it is a religion, and yet its disciples deny that fact. Here's a fun fact: the first Earth Day was heavily intertwined with the whole movement for zero population growth due to overcrowding. You know, brought to you by those people who have never been anywhere but New York City, LA or Tokyo. Obviously if they had ever driven across Nebraska, Wyoming or Montana, they would have seen how ridiculous that particular idea was. Of course the God of the Bible has quite a different view. He instructs us to be fruitful and multiply. That is but one small point of contrast. Anyway, in honor of Earth Day, I prepared a short video for your viewing pleasure. Disclaimer: Tires were most definitely harmed in the making of this video. Enough high octane LEADED gas was used to have powered a Prius for a month. Unfortunately no oil was burned, but only because the old Stude doesn't burn oil. The valve on the nitrous oxide tank was also left in the closed position because that would have just been overkill - even for me. If you find the tone of this post to be a bit mocking of the greenies, you are right. My God, Jehovah, is the creator of the god of the greenies ("mother" earth). My God is infinite in power. That the neutralizing of the result of burning fossil fuels is well within his power is such an understatement as to be laughable. To think that mere humans can significantly effect the earth's climate is supremely egotistical. It is akin to believing you can dilute the salt water of the ocean by carrying cups of fresh water from the lakes. As promised, I am finally getting around to an update on the drag race motor I am building for a customer. It started life as an S&S 113" Evo style motor. Since this is to be a "bracket" engine, the plan is to make as much dependable power as practical on a budget (keeping in mind all budgets are not created equal). In this case, the dependable power side of the equation led us to add as many cubic inches as possible. 5 inch stroke flywheels in place of the OEM 4-1/2 inch units brings the cubic inches to 126. 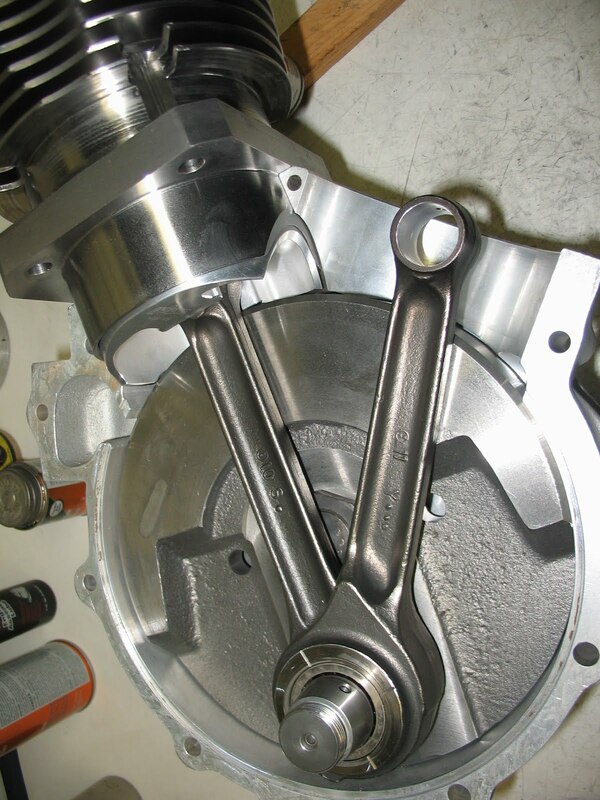 The only 30 degree dome pistons available for a 4 inch bore are a set of J&E from Axtell which feature Twin Cam Wrist pins. Not a big deal to bore the wrist pin end of the S&S rods to take the Twin Cam wrist pins (done it before), but there was some question as to whether I would need to cut down the flywheel O.D. for piston to flywheel clearance. Once the rods were prepped, a quick mock up (below) showed that the clearance was there, which saved the work of building up the scraper for smaller diameter flywheels. Once the stock flywheel diameter was determined to be OK, some weight still needed to come off them. I chose to shave them to my own version of the S&S Knife Edge modification. 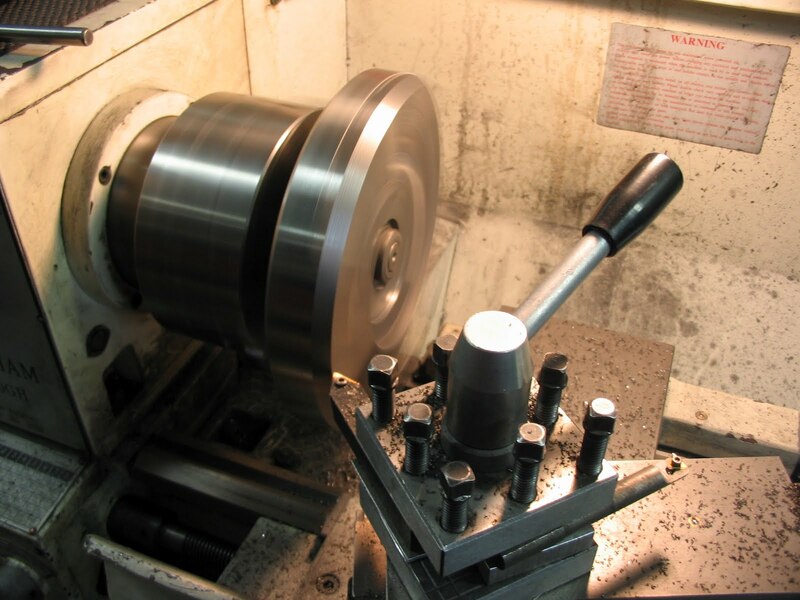 When you have one spinning in the lathe, as shown below, the weight comes off pretty quick. 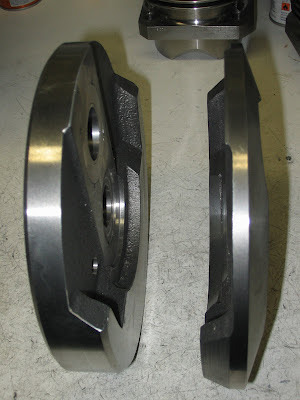 Below is the un-modified flywheel on left, and the lightened on the right. You need to be careful not to remove too much weight from the side opposite the rods, lest you don't leave enough to bring them into balance. This is particularly important to take into consideration when dealing with heavy, big bore pistons. Before balancing, one needs to get the pistons to their final weight. 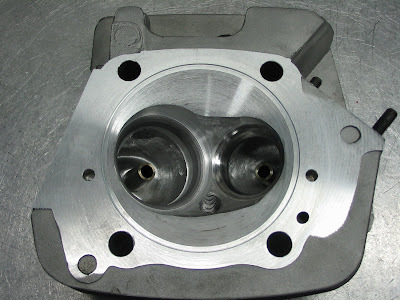 In this case, that meant the combustion chambers needed to be finished so that the compression ratio could be established in case material needed to come off the top of the piston to lower it. 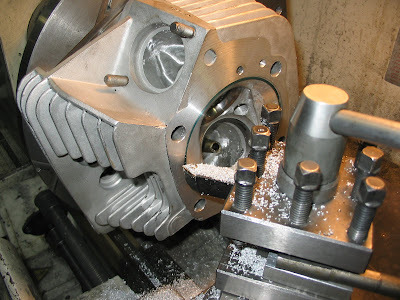 Below, one of the heads is mounted in the lathe to machine a firering recess for the Axtell cylinders, as well as the 30 degree chamber to match the pistons. One of the first steps on this engine build was to weld up the floor of the intake ports. While I was at it, I added some aluminum to the sides of the combustion chamber since I was not sure what it would take to get to my target compression ratio of 16:1. The nearly finished chamber as shown below came out to 20:1 after calculating it with the domed piston. Guess I wouldn't have had to add that material to the chamber! 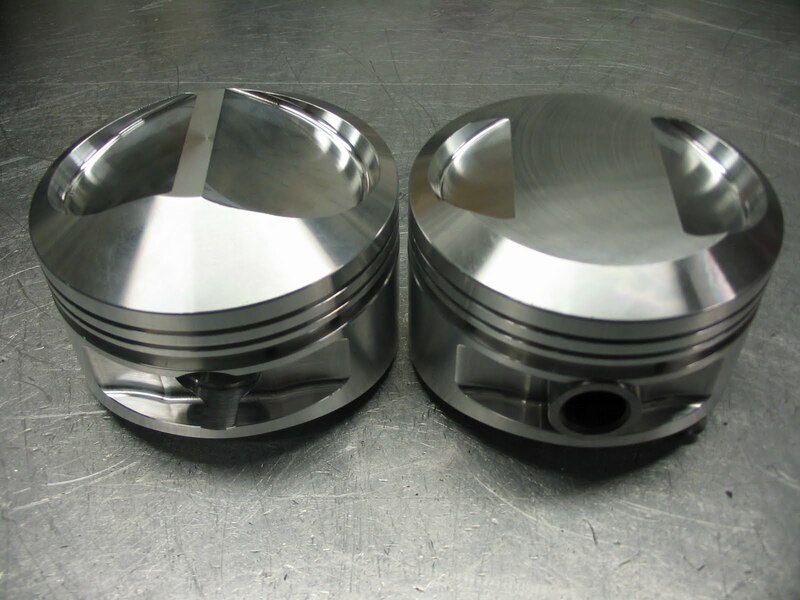 The domes on these 30 degree pistons are solid, which leaves plenty of room for modification. Milling .300" off the top of the dome, as shown below, brought the compression down close to the target. 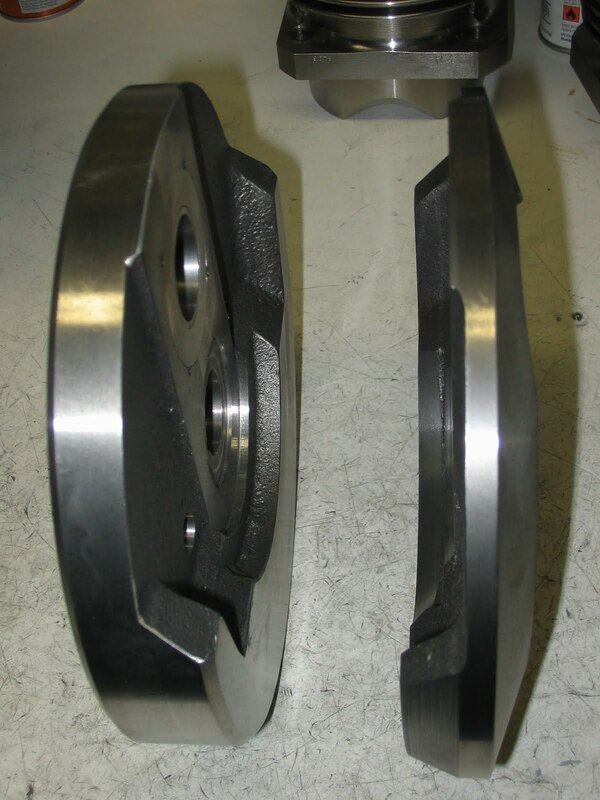 The piston on the right has been machined. More material will be taken out on the under side of the domes to lighten before balancing. The rest of the story is the most important part. Christ Jesus died on that cross, he was buried and on the third day he rose again from the dead. Without that part of the story, the part quoted above is utterly meaningless. And I suppose without some explanation, all of it is meaningless. Christ’s death, burial and resurrection is the gospel. It is the good news! It was the point in time when all of our sins laid upon Jesus. He suffered and died a tortuous death paying the penalty for our sins, though he was completely innocent of any sin. We in turn were declared not guilty in the eyes of God the Father for Christ’s sake. In fact the resurrection of Jesus Christ is our proof that God the Father accepted the sacrifice of his Son as payment for sin! That is not what this post is about, though. I want to talk about these two "malefactors," or thieves as they are referred to elsewhere, who were crucified alongside Jesus. We see a stark contrast between the two here in the book of Luke. When they were first hung on the crosses though, that was not the case. The book of Matthew tells us that initially both of the thieves taunted Jesus along with most of the onlookers. But then, one of the malefactors had second thoughts. He even went so far as to rebuke the other, asking "don’t you fear God?" There are several other things that differentiate between these two thieves. The one recognized his sinfulness and freely admitted that he was receiving the punishment he deserved. Not so with the other. Mocking he said to Jesus, "If you are the Christ, then prove it and save yourself and us!" No trace of humility there. No confession of guilt. Another thing worthy of notice about these two malefactors is that they both were familiar with the claims that Jesus was the Messiah. The one chose to use it as a term of derision and mocking, but somewhere along the line the other one came to believe that Jesus really was the Christ. He not only called him Lord, he asked him to remember him when he came into his kingdom. Because all three of them were about to die, obviously that thief believed in a kingdom that reached beyond the grave, and that Jesus would reign there. One last point of contrast between these two. One thief went to his death still shaking his fist at God, even with the salvation from sin that had been promised from the beginning of the world happening right there in front of him. Certainly this is an example of a hardened heart. But the other...? He showed the signs of repentance and faith. He changed his mind about Jesus. He admitted his sin. He acknowledged Jesus Christ as King. And Christ promised that thief that upon his death he would join him in paradise. Now, just one more point. This incident with the two thieves, though it may be insignificant in comparison to what happened in the rest of the story (that is, the death burial and resurrection of Jesus Christ), does point out something important. As long as they still have breath, it is not too late for a person to repent of their sins and put their faith in Jesus. There was no baptism, no church membership or any other church sacrament, and no good works that played any part in this thief’s salvation ....nor is there for any of us. At the last possible moment, this malefactor was snatched right from the doorstep of hell to be made another trophy of divine mercy and grace!